The demand for the stent is increasing owing to the growing need to treat diseases such as those affecting the heart and blood vessels of the elderly and middle-aged patients. Growing awareness about the benefits of stenting for coronary artery diseases (CAD), peripheral artery diseases (PAD), malignant and benign pancreatic-biliary disorders, and so on, in the developing economies, is set to assist the stent market growth. As a result of all these factors, the stents market is estimated to grow at a CAGR of 5.21% during the forecast period 2019–2024. The Stents market has been categorized into various segments in this report. On the basis of product, the market has been segmented into coronary, peripheral, carotid, neurovascular, biliary and others. Based on material, the market is segmented into the metallic, polymer, and natural. The unhealthy lifestyle of the growing millennial population and the increase in the population of smokers further has led to an increase in cases of atherosclerosis along with hypercholesterolemia. This is estimated to drive the stent market in the future as a significant share of the population with improper food and smoking habits would require coronary and peripheral angioplasty to reopen the blocked arteries. The governments of various developing economies are framing policies so as to lower the selling price of the stent so that such devices can be availed by a higher number of patients with cardiovascular diseases or peripheral diseases. Favorable government policies such as price control and reimbursement will spur the demand for coronary stents in the upcoming years. The base year of the study is 2018, with forecast done up to 2024. The study presents a thorough analysis of the competitive landscape, taking into account the market shares of the leading companies. These provide the key market participants with the necessary business intelligence and help them understand the future of the types of Stents in the global Stents market. The assessment includes the forecast, an overview of the competitive structure, the market shares of the competitors, as well as the market trends, market demands, market drivers, market challenges, and product analysis. The market drivers and restraints have been assessed to fathom their impact over the forecast period. This report further identifies the key opportunities for growth while also detailing the key challenges and possible threats. The key areas of focus include the types of stents, and its specific applications in the stents market. Product Type of Stents: Coronary, peripheral, carotid, neurovascular, biliary and others. Materials of Stents: Metallic, polymer and natural. Boston Scientific Corporation and Medtronic PLC, are the two major providers of Stents. Abott Laboratories, B Barun AG and Terumo Corporation are the other major companies in the stents market. Boston Scientific Corporation, through its broad range of products, constant product launches, and innovation, has been successful in catering to a variety of customers. Monitoring its future business involvements, IndustryARC analysts expect Boston to maintain its position in the market. The recovery time for Percutaneous Coronary Intervention (PCI) is significantly lesser than the open-heart surgeries and bypass surgeries. PCI can be performed in a shorter interval of time compared to bypass surgery as the stent is inserted into the body from the groin area or arm through a catheter. Owing to the lesser recovery time and in-hospital time, the adoption of stents for cardio vascular diseases is set to grow at a healthy rate in the future. The high demand for minimally invasive surgical procedures will also significantly drive the coronary stents market growth over the forecast period. 1. Is the market for Stents growing? How long will it continue to grow and at what rate? 2. Which type of Stents presents the major growth opportunities? 3. Is there a possibility for change in the Stents structure over time? 6. What is the current status of Stents in different countries? 7. Which are the major relevant product segments within the Stents? 8. Which type of Stents will witness heavy adoption of end user in the near future? 9. What are the short-term, long-term, and medium-term growth drivers for the Stents? 10. What are the short-term, medium-term, and long-term challenges for the Stents? 11. What are the short-term, medium-term, and long-term opportunities for the Stents? 12.	Who are the top players/companies of the Stents market? 13. What are the recent innovations in the Stents market? 16. What is the futuristic scenario for the adoption of different types of Stents? 17. What is our Vision 2030 for the Stents market? Give a deep-dive analysis of the key operational strategies with focus on the corporate structure, R&D strategies, localization strategies, production capabilities, and sales performance of various companies. Provide an overview of the product portfolio, including product planning, development, and positioning. Discuss the role of technology companies in partnerships. Explore the regional sales activities. Analyze the market size and giving the forecast for the current and future Stents market during the forecast period 2019–2024. Analyze the competitive factors, competitor’s market shares, product capabilities, and supply chain structures. The Stents market size is evaluated based on the number of products per organization type along with the varying price points pertaining to specific applications. These were identified as key informational conjectures for market estimation in 2018/2019. The Stents market share is thoroughly checked against all data points that have been incorporated and rechecked against various data sources. Various C-level executives and key opinion leaders are contacted for verification of the data. The Stents market forecast and growth rate are achieved by applying the time series forecasting methodology on the various factors. The market forecast and growth rate are further backed with historical trends of the market along with a regressive mathematical model that assesses the value based on factors such as capital expenditure, equipment lifespan, R&D investments, and so on. The Stents market demand has been researched taking into account the prominent economies across the different geographic regions to understand their corresponding impact on the market. The Stents market drivers are evaluated for short-term, medium-term, and long-term based on the different market dynamics impacting the market. 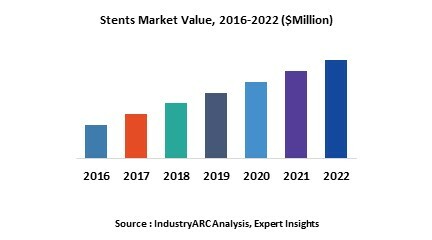 The Stents market challenges are evaluated for short-term, medium-term, and long-term based on the different market dynamics impacting the market. The Stents market trends have been analyzed taking into consideration the micro and macro trends prevalent in various geographies. The Stents market outlook provides a brief overview of the market performance and anticipated change in market dynamics. The Stents market analysis also involves the identification of new companies that have entered the market scenario and their impact on the market dynamics in the future. "*Financials of private companies would be provided on a best-efforts basis "